The Westport Farmers’ Market strongly supports sustainable agriculture. At the Market today, silverware replaced plastic utensils. One fork, knife or spoon can be used over and over, thousands of times. 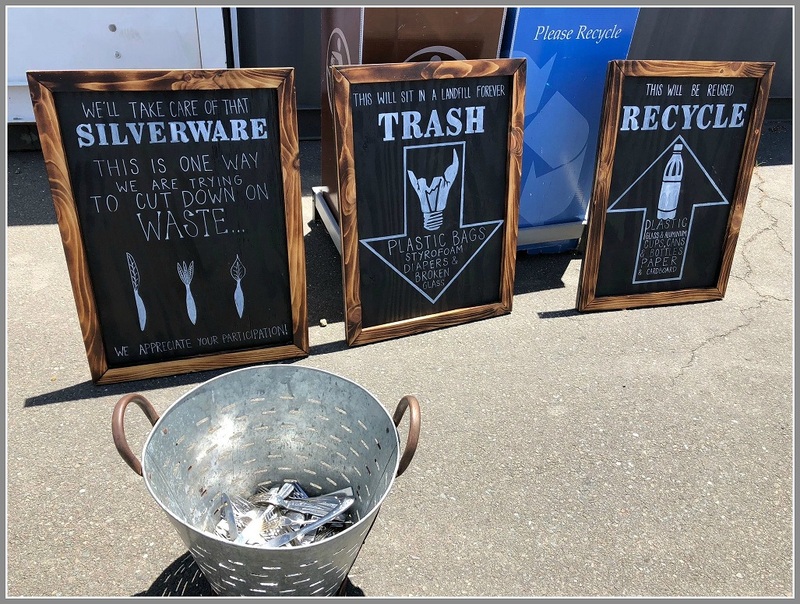 Prominent signs pointed the way — and educated market-goers on the importance of recycling. This entry was posted in Environment, Organizations, Pic of the Day and tagged " Westport artists colony, Recycling. Bookmark the permalink. Love this. Plus, it’s so much nicer to eat with real utensils! I know it’s been suggested a few times that our school cafeterias go back to washing and reusing metal flatware. Why can’t we do that? Back in my elementary school days, students took turns with cafeteria chores like wiping down the tables, returning trays (which were also reused) and helping with hand washing those trays, plates, and real forks knives(dull) and spoons. We were young enough that we liked helping out- we also learned responsibility and practiced being “green” before it was a thing. In middle and high school we couldn’t spare the class time, so staff was on their own, but I like to think we were at least slightly less messy and slightly more appreciative because we knew what had to be done to feed and clean up after a bunch of kids!